From a communications standpoint, this is a crisis. The local authorities and government did many great things to handle this situation. 1). Response time. 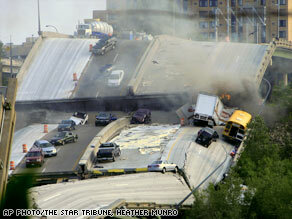 Witness accounts on CNN, Kare 11 and Fox News, all said that emergency teams responded quickly to the accident. 2). Limited speculation. Rather than forecasting death tolls and injury reports, local officials waited until they verified information before saying an official death toll. * It provides accurate information. * It alerts families of victims what they should be prepared for. * Forecasted numbers do not mean much to the general public, unless it is a more fatal tragedy. 3). Periodic updates. The mayor, governor, Red Cross spokesperson and various other people gave updated information roughly every 45 minutes. The information was not only about the accident scene, but also travel information, an issue affecting many people around the metro area. All in all, I think the local authorities did a great job with an unusual crisis situation.